The Swingline ClassicCut Lite Guillotine Trimmer is simple, steady and precise, with a sharp guillotine blade that cuts through papers with ease and an alignment grid that ensures accuracy. Sturdy trimmer is also light and easily transportable, with a durable plastic base. A 15 cutting length makes it a convenient choice for most general trimming tasks, whether at home or in the office. The trimmer easily cuts paper, photos, and more, cutting up to 10 sheets each time. The alignment grid helps ensure precision. A dual scale ruler, with marks in inches and centimeters, allows for easy measuring, regardless of which system you prefer. Safety features include a guard rail to keep your fingers away from the blade when cutting, and a blade latch hook that secures the arm in a locked position when the trimmer is not in use. Swingline backs this high-quality trimmer with a limited 10-year warranty. EASY TO USE TRIMMER - Lite trimmer is simple and easy to use, with a sharp guillotine blade and a handy alignment grid. Built with a sturdy plastic base, it's also light enough for easy transport. 15 CUTTING LENGTH - With a 15 cutting length, it's a convenient choice for most common trimming tasks. Ideal for use in the home or at the office. 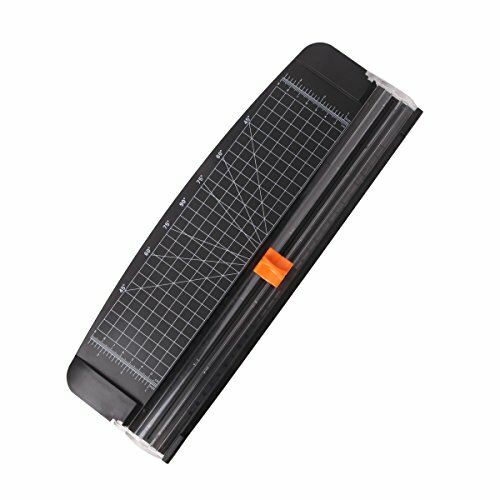 CUTS 10 SHEETS - Excellent for everyday use, this neat little trimmer cuts through paper, photos and more, cleanly cutting up to 10 sheets at a time. ACCURATE CUTS - Designed for accuracy, with an alignment grid for precision. Dual scale ruler, with marks in inches and centimeters, assists with measuring, regardless of which system you prefer. SAFETY FEATURES - Guard rail keeps fingers safely away from the blade while it's in use. Blade latch hook securely locks the trimmer arm when not in use. BUILT TO LAST - Swingline stands behind this high-quality trimmer with a limited 10-year warranty. 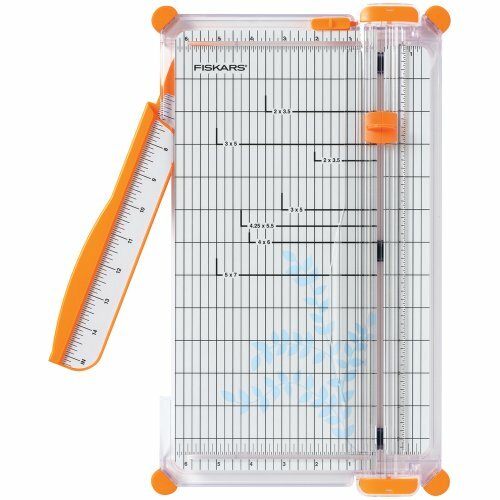 Whatever the project, Fiskars SureCut Deluxe Craft Paper Trimmer gets the job done with precision. The SureCut wire cut-line indicates exactly where the blade will cut your paper, photo, scrapbook page or specialty material. Fiskars patented TripleTrack System interlocks the blade and rail for straight, precise cuts every time. This deluxe trimmer includes the widest base on the market and a self-leveling swing-out arm that extends the measuring deck to over 15 inch to manage all your extra-large crafting material. 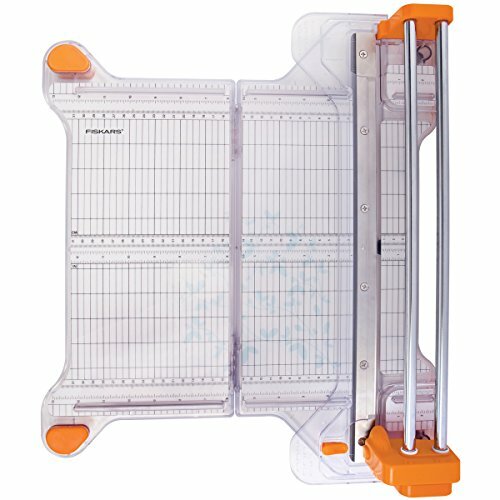 A permanent scale and grid cutting mat helps ensure cutting accuracy. An ergonomically designed, high-profile blade carriage is easy-to-grip to help you make accurate cuts quickly. It even includes a lightweight design, so it s easy to carry this trimmer along to your next big crafting event. FSK01005452 Bypass trimmer features self-sharpening blades so no replacement blades are needed. Blade cuts up to 10 sheets of paper at a time. Cutting arm lock is built-in for safe transporting and storage. Use precision printed scale and grid on base for easy alignment. Trimmer also features a paper clamp, smudge guard and anti-skid rubber feet for stability. Trimmer base is made from 100 percent recycled post-consumer resin. -Product Type: Trimmer. -Country of Origin: China. -Cutting Length: 12''. -Cutting Support: 10 Sheet. -Recycled: Yes. -Recycled Content: 100pct. -Post-consumer-wastepct: 100pct. -Assembly Required: No. -Color: Black. -Color: Orange. -Brand Name: Fiskars. -Features: Self-sharpening. -Features: Non-skid Rubber Feet. -Features: Alignment Grid. -Manufacturer: Fiskars Corporation. -Product Model: 01-005452. -Product Name: Bypass Trimmer. -Dimensions: 3'' Height x 21.30'' Width x 14.90'' Depth. -Manufacturer Part Number: 01-005452. -Packaged Quantity: 1. Fiskars-ProCision Rotary Bypass Trimmer. Perfect for mixed media projects! The self-sharpening blade never needs replacing. Cut through chipboard, cork, burlap paper, vinyl, foam and layers of cardstock. This package contains one procision rotary bypass trimmer with a paper guard, a rotary bypass blade carriage, measurements in metric/inch measurements, an expanded grid by 2-1/2 inches, rubberized feet, a paper guard lock, a permanent grid and a folding deck for easier storage. Measures approximately 14-1/2x19- 1/2x4 inches when folded out to full length. Do not carry from cutting bar (will bend over time). Imported. Prefect for cutting A4 and A5 Paper. Ideal to cut Photo, Picture, Label, Card and more paper products. Professional guillotine can cut through chipboard, card stock, great for home office and school functions or craft projects. Simply measure and line up your papers to get the exact same, flawless trimming results each time. 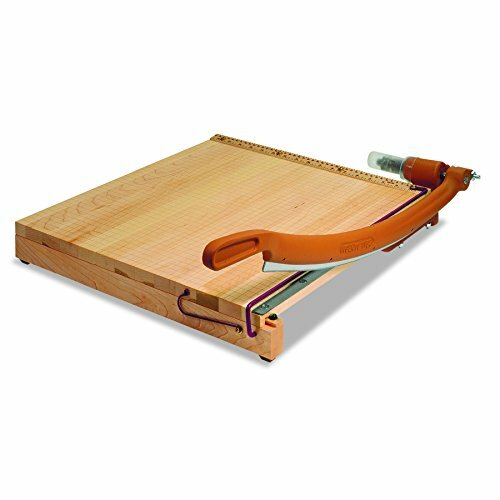 Durable and precise, the X-ACTO Heavy Duty Wood Guillotine Trimmer cuts high volumes of paper with ease. 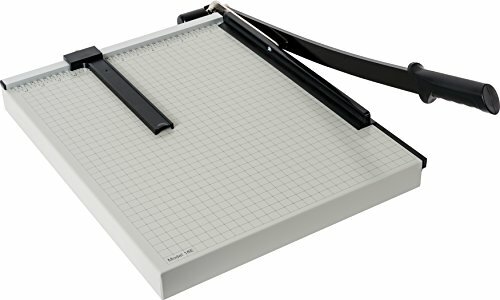 With the ability to cut up to 15 sheets at a time, this trimmer creates quick and accurate straight cuts through paper, film, or photographs. This trimmer is designed for heavy-duty use with a solid wood base and rubber feet for steady cutting. The Perpetual Edge self-sharpening system ensures the cutting blade is sharp, while multiple safety features help keep fingers away from the blades. Choose our SureCut Scrapbooking Paper Trimmer to bring a new level of precision to your next scrapbooking project. 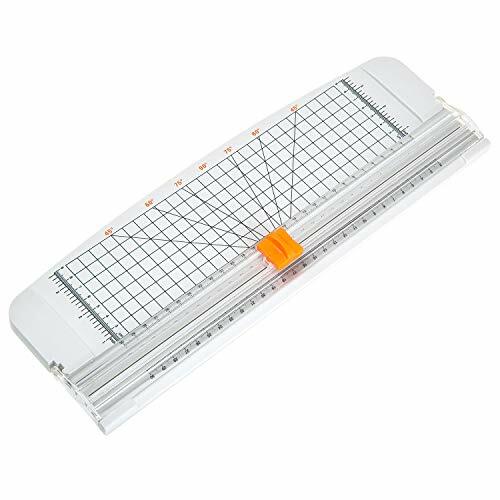 The SureCut wire cut-line indicates exactly where the blade will cut your scrapbook page. Our patented TripleTrack System interlocks the blade and rail for straight, precise cuts every time. 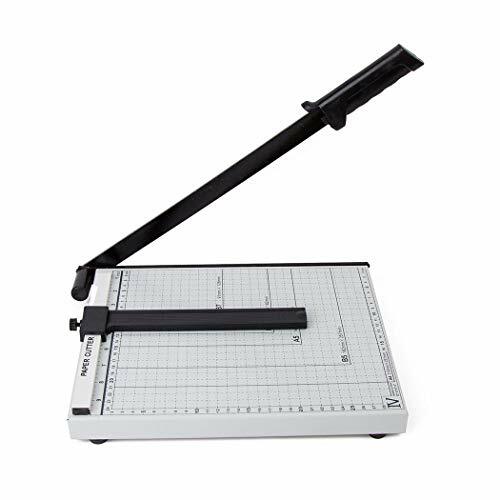 This trimmer can even handle extra-large scrapbook pages with precision a self-leveling swing-out arm extends the measuring deck to a full 12". A permanent scale and grid cutting mat helps ensure cutting accuracy. An ergonomically designed, high-profile blade carriage is easy-to-grip to help you make accurate cuts quickly. 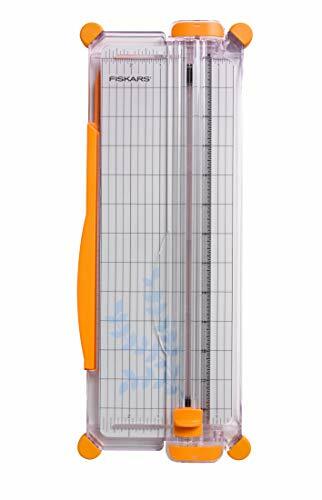 It even includes a lightweight, portable design, so it s easy to take this trimmer wherever your passion for scrapbooking takes you. 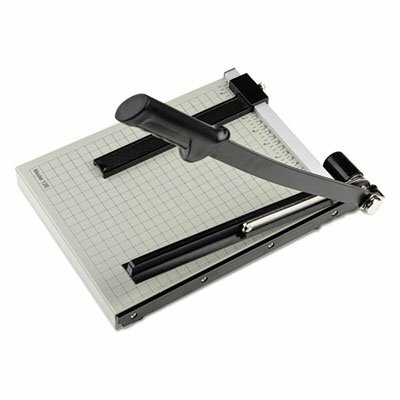 12" personal paper trimmer, bend-resistant rails and aluminum alignment grid. Sleek, space-saving design features durable rails that won't bend or bow, so you get a straight, true cut every time. Compact 12 trimmer is ideal for home office or craft projects. Easy-to-read aluminum measuring grid for proper alignment and accurate cuts. Professional rotary trimmer with 18" blade is ideal for a variety of office functions as well as school, arts and crafts projects. Patented Carl rails and premium carbide blades hold paper and paperboards firmly in place and cut more precisely. Trimmer has a sturdy, metal calibrated base for accuracy and added stability and features preset measurements for common-sized items. 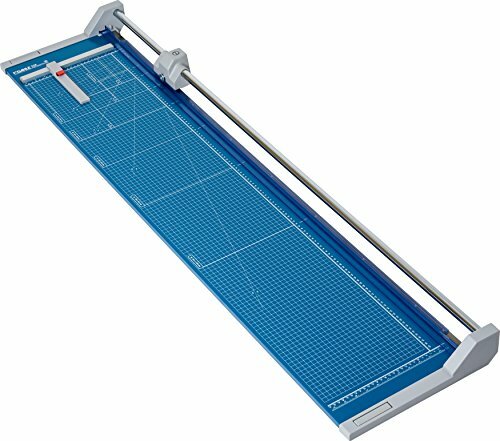 Use trimmer to cut mat board, cardstock, plastic sheets, and more. Blade cuts up to 10 sheets of standard copy paper. Use optional B-Series blades (not included) for 11 different cutting patterns. 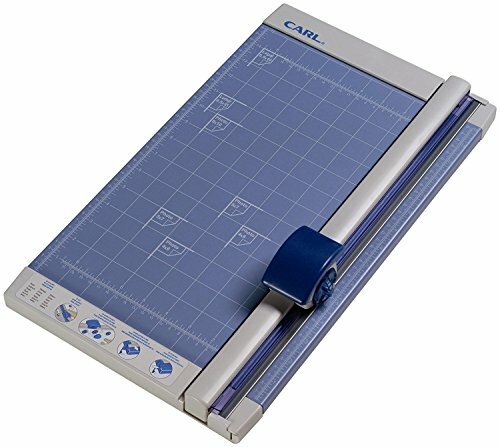 CARL Professional 10 sheet rotary paper trimmer with a solid metal calibrated base board, carbide blade, patented rail system and alignment grid and ruler. Count on precise, accurate cuts with the premium carbide blade. CARL Model number RT-218, cuts up to 10 sheets. Patented rail system holds paper firmly to ensure a sharp edge and exact cut. Sturdy metal base is calibrated and features preset measurements for common-sized items. Rolling Trimmers are the new generation of paper cutters. 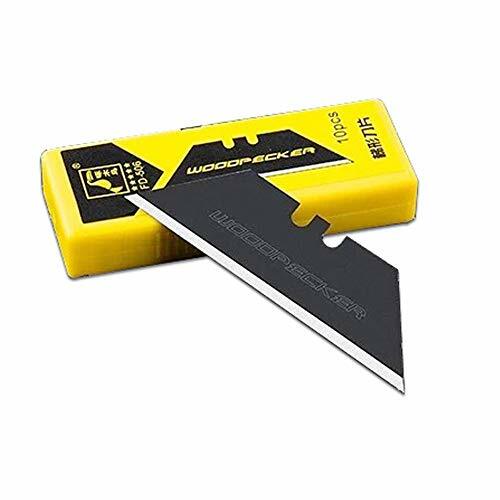 Designed for safety and accuracy, the cutting blades are encased in a plastic housing that virtually eliminates the chance of personal injury. The rotary action of these trimmers allow the blade to cut in either direction and sharpen itself as it cuts. It s this self sharpening action that produces clean burr-free cut and guarantees many years of smooth precise cutting. Great for photographers, craft enthusiasts and office professionals. 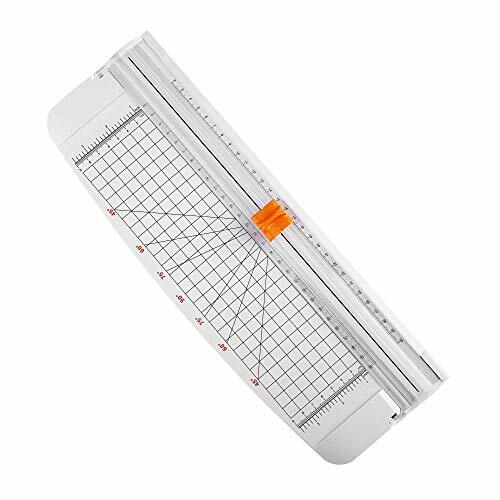 Specifically designed to cut multiple layers, a rotary cutter with a 6" x 24" ruler attached makes measuring and making perfect cuts through fabric easier than ever. Great for beginners, the unique design of this tool makes perfect cuts through fabric a breeze. Since you re not managing two tools separately, you don t have to struggle with a misaligned ruler or worry about holding the rotary cutter straight. It includes a 45 mm spring-action rotary blade that makes clean cuts through multiple layers of fabric and an ergonomic blade carriage that makes cutting smooth and easy. The ruler features a bold 6" x 24" grid that is printed on both sides for right- or left-handed use, plus highlighted numbers for excellent visibility on light or dark fabric. The unique rail design prevents lint build up as you work, the no-touch magnetic blade change system makes blade change safe and easy while storing used blades, and a carrying handle offers easy, convenient transportation. *Sleek, lightweight & portable: designed for standard cutting of paper, photos and labels. * Capable of cutting a 45-degree to 90-degree angle. * Max cut 12 sheets paper (80g/m2), perfect for mixed media projects! * Plastic cutting surface improves scale visibility for accurate measurements. * Patented Track System interlocks the blade and rail for cuts that are straight and steady. * Cutting through chipboard, card stock, ideal for home office functions or craft projects. Prefect for cutting A3, A4 and A5 Paper. Ideal to cut Photo, Picture, Label, Card and more paper products. Capable of cutting a 45-degree to 90-degree angle. Max cut 10 sheets paper (80g/m2) each time. Great for typical, daily trimming needs. Patented track system with sharp trimming mechanism and ruler, interlock the blade and make the exact same, flawless trimming results each time. Safe Pressing Design: The blade in the protective case works only when you press on it, which perfectly avoids dangers of being cut in transportation. The Swingline ClassicCut Ingento Trimmer combines classic design and modern innovation for long-lasting durability. Constructed with a solid maple base, a die-cast metal arm and a self-sharpening steel blade, it's a solid bet for steady service. Premium trimmer delivers dependable performance. Featuring an 18 cutting length, this trimmer is perfect for shared workspaces. The self-sharpening steel blade slices through paper, photos, and more, cutting up to 15 sheets at once. Making precise cuts is easy with the convenient alignment grid. A dual scale ruler on the base allows for easy measuring, with marks in both inches and centimeters. Steel tension spring holds the blade steady, keeping it firmly in place in any position and preventing accidents. A blade latch hook secures the arm when not in use, and a guard rail also works to preserve user safety. Swingline backs this high-quality trimmer with a limited 10-year warranty. DURABLE CONSTRUCTION - Ingento guillotine-style trimmer delivers dependable performance. Built strong, with a solid maple base, die-cast metal arm and self-sharpening steel blade. 18 CUTTING LENGTH - Features an 18 cutting length, allowing plenty of space to accommodate creative projects. Solid base with non-slip feet. Large trimmer is perfect for shared workspaces. CUTS 15 SHEETS - Strong trimmer cuts up to 15 sheets of paper at a time. Suitable for cutting everything from delicate tissue to photos and heavy matboard. Ideal for high-volume projects. ACCURATE CUTTING - Designed for accuracy, with an alignment grid for precision. Dual scale ruler, with marks in inches and centimeters, assists with measuring, regardless of which system you prefer. SAFETY FEATURES - Steel tension spring holds guillotine blade arm firmly in place in any position. Blade latch hook secures the arm when not in use. Protective guard rail also helps keep users safe. 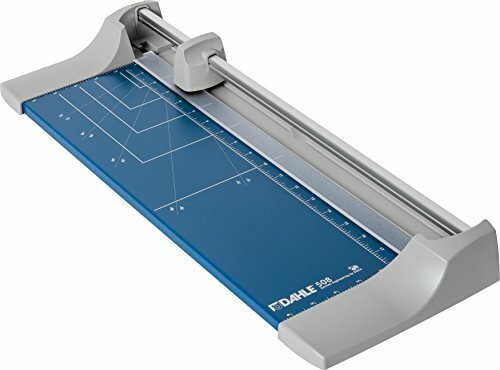 Dahle Vantage Trimmers are a popular choice for the school, home, and office. Whether you are cutting a single sheet of paper or fifteen at a time, Dahle's Vantage Trimmer is the perfect tool for all of your cutting needs. 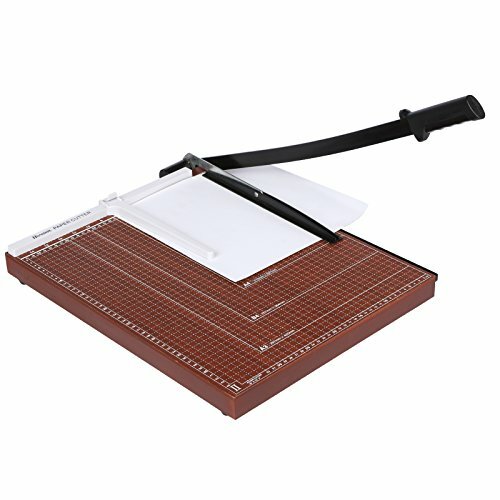 This traditional style paper cutter has many unique features that offer safety and convenience while giving you the accuracy you require. The machine ground, lever-style blade is sharp, accurate, and can remove even the tiniest sliver of paper from your work. To ensure an even cut, the trimmer's automatic clamp provides firm, even pressure to prevents paper from shifting. For safety, the spring action handle prevents the blade from falling down unexpectedly. To protect the blade and keep fingers safe, the handle can be locked in the down position. For durability, the sturdy metal base provides a solid foundation. It's designed to hold up to rigorous activity, day in and day out. For measuring, this base contains carefully screened guides, and an adjustable backstop which is the easiest way to ensure accuracy during repetitive cuts. The lightweight materials make it portable enough to take anywhere. A great choice for the school, home, and office use. 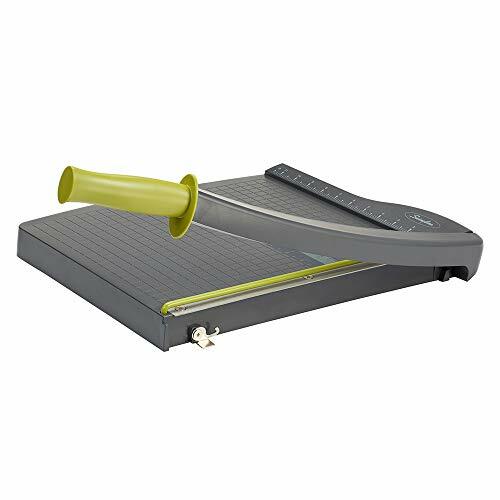 Our Portable Stack & Guillotine Paper Trimmers provide you with perfect cutting experience. 1.Blade hidden design protects fingers away from any dangerous operation. 2.Designed for cutting of A3, A4, A5 paper, photos, card and labels. 3.Lightweight, compact and portable, plastic cutting surface improves scale visibility for accurate measurements. 4.The anti-skip mat on the back of the cutter provides a solid foundation that will never warp or crack. 5.Patented track system with sharp trimming mechanism and ruler, interlock the blade and make the exact same, flawless trimming results each time. 6.Capable of cutting a 45-degree to 90-degree angle. Max cut 10 sheets paper (80g/m2), our small white paper cutter is your best choice of craft projects for home, office and school. 1. Put the paper under the clear bar. 2. Press down the orange blade cube to slice the paper. 3. Very easy to change the blade, just slightly spread the clear sections apart, then the blade cube pops out. * You'd better clean the blades after you finish cutting. * The blade is replaceable, please replace it when it becomes blunt. * Your satisfaction is our greatest pursuit, please feel free to contact with us if you have any question. 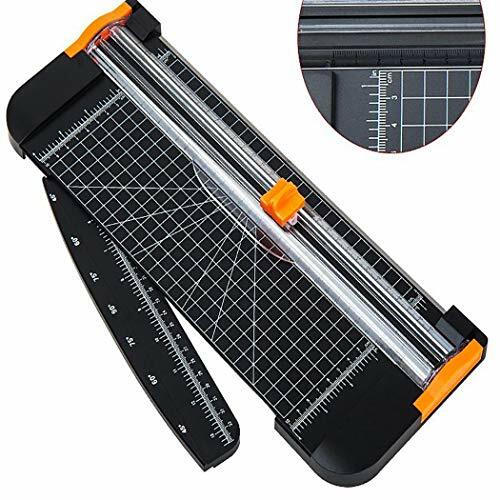 Professional Paper Cutter Design to cut A3/A4/A5 Paper, the sharp blade of the paper trimmer slides paper neatly and easily, leaves clean lines, no fuzz or jagged edges, easily provide you perfectly cutting experience. Portable and Safe This cutter is lightweight and convenient, the blade in the protective case works only when you press on it, perfectly protect user's finger especially children. Sharp and Replaceable Blades With special titanium blade which harder than steel helps the cutter stay sharper, No drag! Max cut 10 paper (80g/m2) each time, no fuzz or jagged edges. You can also replace the blade easily when it becomes blunt. Accurate Measurement The guillotine cutter includes a tile grids and angle cutting features. A range of straight and angled lines ensure that every cutting is accurate as you wanted. Professional Cutting Tool Ideal for cutting a wide variety of crafting materials including origami paper, DIY gift cards, wedding invitation, photos, scrapbook, labels, coupons and more paper products. Suitable for home, office, and school. Designed for safety and accuracy, the cutting blades are encased in a plastic housing that virtually eliminates the chance of personal injury. The rotary action of these trimmers allow the blade to cut in either direction and sharpen itself as it cuts. It s this self sharpening action that produces a clean burr-free cut and guarantees many years of smooth precise cutting. Dahle s Professional Trimmers are designed for heavy duty applications where precision is essential. These trimmers are equipped with a ground self-sharpening blade that cuts in either direction. 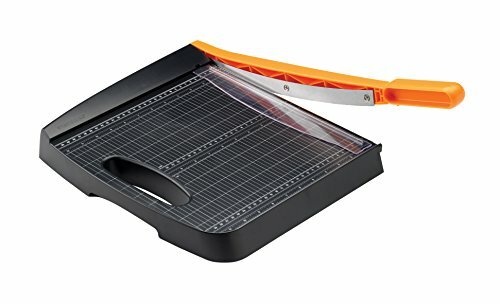 This series is perfect for cutting paper, trimming photographs, and large format printing. These trimmers can be wall mounted and have a optional floor stand Model 698. Warranty: Dahle North America, Inc. offers a lifetime warranty against defects in manufacturing, materials and assembly (excludes cutting blades and clamp). This warranty applies to the original owner only. It does not cover damage caused by abuse, misuse, or unauthorized repair. For warranty service, please call a Dahle Customer Relations Representative at (800) 995-1379. Trimmer is simple and easy to use. With a sharp guillotine blade and a handy alignment grid. Built with a sturdy base, it's also light enough for easy transport. De signed to hold up to rigorous activity, day in and day out. The machine-ground, lever-style blade is sharp and accurate enough that it can re move even the tiniest sliver of paper from your work. For safety, a spring-action handle prevents the blade from falling down unexpectedly. Lightweight and marked with guides, Vantage trimmers offer safety and convenience, while giving you the accuracy you require. To ensure an even cut, each trimmer features an automatic clamp that provides firm, even pressure, pre venting paper from shifting. To protect the blade and keep fingers safe, the handle can be locked in the down position. For durability, the sturdy metal base provides a solid foundation. For measuring, the base contains carefully screened guides and an adjustable backstop -- which is the easiest way to ensure accuracy during repetitive cuts. And for portability, it's designed to be light enough to take anywhere. 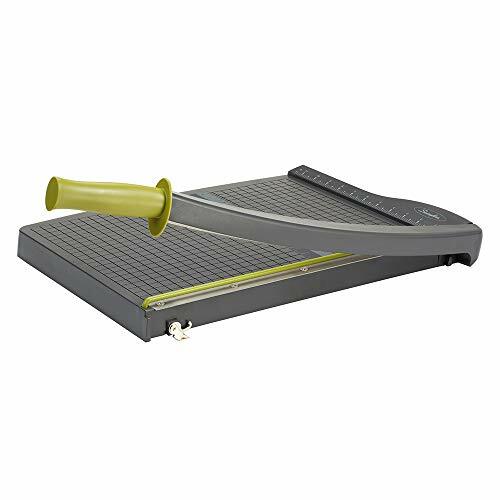 Trimmer Board Type: Guillotine; Sheet Capacity: 15; Cut Length: 12"; Blade Material: Metal. Brand: DAHLE | Manufacturer: DAHLE U.S.A., INC. The Aurora 12" Paper Trimmer is compact, lightweight and precise, with a sharp cutting blade that cuts through paper and photo with ease. The printed scale and grid assist user to accurately align projects for cutting. Integrated safety clamp keeps your fingers safely away from the blade when cutting. Built with a sturdy plastic base, it's also light enough for easy transport. 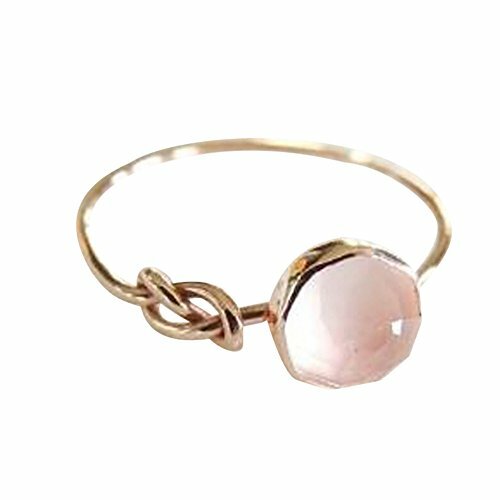 Suitable for the object: Suitable for all women. Made of high-grade alloy material. 360 no dead angle grinding processing. Uses top metal plating technology. The paper trimmer is easy and convenient to cut up to 12 sheets at one time, making your cutting work more efficient. Product Size -- 48.5 x 38.5 x 3.3cm/ 18.9 x 15.0 x 1.3inch (L x W x H)---A2, A3, B4, A4, B5, A5, B6, B7 measurements printed on the base satisfied your different needs alignment grid and dual scale ruler for precise measuring and to help keep straight. 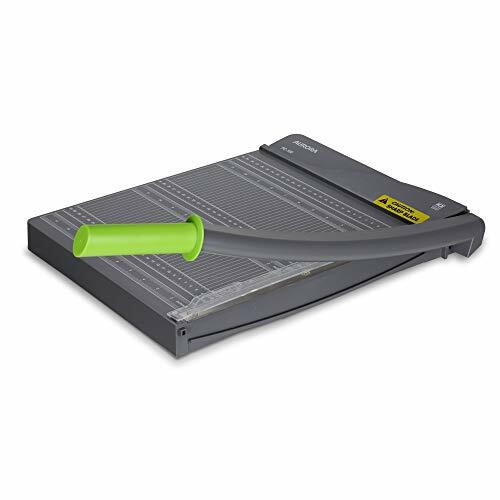 High Quality -- Sturdy and lightweight paper trimmer, Improved greatly, made of wooden plastic and metal, and now no longer as heavy as an anvil, lightweight but sturdy. High quality durable solid metal base and sturdy blades make accurate and straight cuts. High Efficiency -- Max Cuts, 12 sheets capacity and 12 Inch cut length with clean and neat cut, make sure the paper/file is neatly arranged so as to cut smoothly. Ergonomic designed comfortable handle and paper clamp for holding paper well makes cutting easy. Accurate and Safe -- Adjustable Paper Guide for repetitive cuts. Alignment grid and ruler printing on the trimmer base for accurate measuring, cutting easy and safe, never worry about finger cuts. Lock the blade to the safety locking device when the trimmer needn't to using. Widely Application -- This paper cutter trimmer is perfect for offices, schools, churches, businesses as well as professional individual users, Ideal to cut Photo, Picture, Label, Card and more paper products. 12 CUTTING LENGTH - With a 12 cutting length, it's a convenient choice for most common trimming tasks. Ideal for use in the home or at the office. H-E (High-End) is originally factory made, Reliable and Long life with quality guaranteed. Easy and quick to install and replace (with professional stuff). Suitable forManual Large Format Paper Trimmer Cutter.